3D objects can be printed in a variety of materials. Unfortunately there are many incorrect views about ABS and PLA. Therefore, we will explain the difference again more closely. In the rapid prototyping technology Fused Deposition Modelling (FDM) a number of thermoplastic materials can be processed, most of it are plastics. For the 3D printing users the question arises which filament material is best suited for the printed component. This contribution shows a comparison of the two most used FDM / FFF materials ABS and PLA. This comparison is based among other things on the results of a study carried out as a work project of the University of Applied Sciences Kaiserslautern, Pirmasens Campus. The values shown represent values for standard PLA and standard ABS and are therefore not applicable for special PLA and ABS filaments, such as. "Flexible-PLA"
When choosing the correct filament ne usually decides between ABS and PLA. Thus, although there are numerous further filament varieties available, but with respect to the print quality and versatility of PLA and ABS, it is usually these two plastics, which are suitable for use in question. It should be mentioned that for 3D printing beginners PLA filament is more suitable because it is easier to print, and show no significant problems in printing where ABS is a little more difficult, hosting some problems. Particularly noteworthy is the so-called. "Warp" effect (below image). Among them, the arching of a component due to different cooling temperatures of the different layers - and the resulting internal stresse. Furthermore, ABS tends to have a poorer adhesion to the build platform, while these adhesion problems do not occur with PLA. ABS is recommended for advanced users, as a certain experience is needed here. Polylactide, short PLA (from the English word "polylactic acid"), is a biodegradable plastic (biopolymer), which from renewable resources - is made - such as corn starch or sugar cane. Chemically, PLA belongs to the group of polyester and consists of many lined up lactic acid monomers. Polylactides are produced via catalytic ring opening polymerization of Lactidmolecules or esterification of lactic acid monomers. Typical PLA products are film, foil, cans, cups or mugs. Acrylonitrile-butadiene-styrene, ABS in short, is an amorphous thermoplastic that is characterized by high strength, good chemical resistance, high hardness and good scratch resistance. ABS is built up of three different monomers: acrylonitrile, (1,3), butadiene and styrene. Thus, ABS is one of the terpolymers. The plastic first time produced in 1946 has a "natural coloring" yellow character. Typical ABS-products are z. B. Lego® blocks. 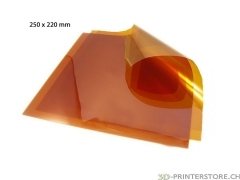 The melting temperatures of PLA filaments will be around 160-190°C (Table) and is well below the melting temperatures of ABS with about 210 to 240°C. The processing temperature of the filaments should be chosen to be significantly higher than the melting temperature. The suitable temperature for PLA is 180-210°C and for ABS is 215 - 250°C (where the heated bed temperature should be anywhere from 100 to 125°C). 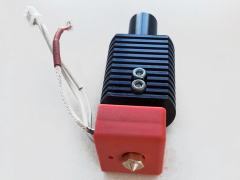 For PLA a print bed temperature from 50-70°C can be selected. 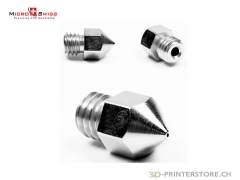 The exact temperatures depend on the used filament and printer nozzle. The temperature of the print bed must always lie below the softening temperature of the filament, as otherwise the component will deforme. With PLA, a heated bed is not absolutely required but for ABS, however, it is an indispensable part. Post-treatment of parts by milling, drilling, turning, coat, etc. with ABS because of the good impact strength properties are better achievable than with PLA. All further information about other suitable materials can be found directly in the individual product groups.